Not quite gardening but he must have come inside from the garden. I woke up this morning to see this very large spider above my head on the ceiling! I’m generally not scared of spiders. They leave me alone and I stay away from them so I have a fairly healthy relationship with them. But this is just a bit too much for me … and frankly, I’m terrified of this guy (or gal?). The spider is about 15 cm in length and has been sitting in the same spot since I woke up this morning. Unfortunately my camera and macro lens “went away for the weekend”, so this is the best shot I can get until my camera comes home this afternoon, hopefully with some muscle to help me get rid of this spider. Well … not rid of it but moved to a more acceptable (to me) location! Does anyone have any idea what kind of spider this is? I’ve spent the better part of two hours trying to ID it via info on the internet. 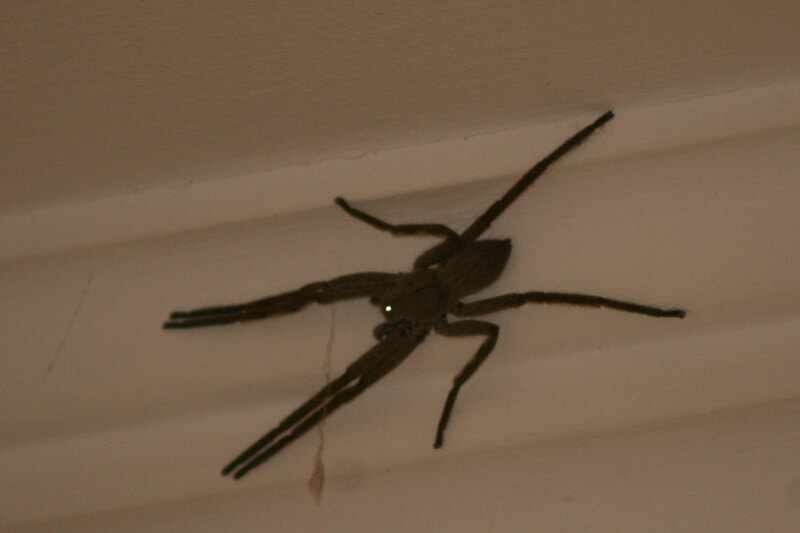 The best I can come up with is that it is a common house spider, baboon spider or huntsman spider, all of which are apparantly not dangerous to humans. We had quite a storm here last night. The garden is a mess this morning with branches and debris everywhere, so I’m guessing she was somehow forced inside by the wind or dislodged from her web. To me the spider looks black, but from the photographs it appears to be a dark brown, not black at all. You can click on the photos to see the enlargement. I am so glad that you have no intention of killing the rain spider. I live by the Dreyersdale farm in Tokai and we get so many around end of April till end of August, after that I don’t see them till the following year again. I used to be so scared of them, until I learnt how to remove them from my place. Must admit at times I still get a shiver down my spin. I take a 30cm glass bowl and place it over the spider on the ceiling or wall, then I slide a stiff piece of cardboard under, sliding the spider into the bowl. It can’t escape as the bowl is placed over. Real easy way of removing it. I then did some research on the spider and it eats the mosquito’s on the ceiling….sure made me think of the rain spider in a different light. I read on the net that some people spray the spider with doom, which then dies a horrible slow painful death…made me so sad to read that……we also have wasps here….they use paralyzing toxins to inject into the rain spider. Lay eggs which when hatched feed off the spider which is still paralyzed. A friend of mine found a paralyzed rain spider and nursed it back to health by protecting it and giving it water. If you are in the garden and find a huge nest spun with leaves…..would be after the rains are done…then you have found the rain spiders nest….with a rather large amount of babies in it. People are so scared of this spider that they are killed as soon as they are spotted….all rather sad. They still scare me though….but I do appreciate their beauty…..found one outside my door last year and it was eating one of those orange yellow hairy worms….sucked the worm dry….next day found the spider dead as well as the worm……. googled the worm and read that it was poisonous to the spider. Took a whole lot of photos with the dead spider though………. 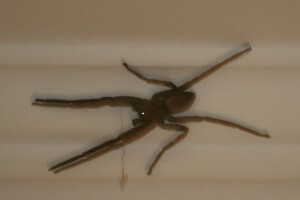 We often find rain spiders in our home, but they are quite easy to remove. My eldest son lets them climb onto his hand, and then takes them into the garden. Oh no!! That would scare me to death!! Scarey Spider Update: The “Muscle” arrived and swept the spider away!! So I can safely sleep in my bed tonight. Haha Holley – my cat is too much of a prissy kitty to get involved in chasing spiders! And my 65kg Rottweiler is as scared of it as I am … I think. He has no fear when it comes to big threatening humans or dogs, but creepy crawleys he actually jumps backwards. OMG I would die of a heart attack if I woke up and saw that giant thing!!!! I’m not particularly scared of spiders but that’s enough to send panic through me. Yes exactly, me too. I am quite happy to co-exist with little spiders (especially the ones outside – I welcome them), but this guy was in a whole different league! I’ve never seen one that big before, never mind right above my head! Thats hilarious!! I love that you were the “muscle” in operation “get rid of the spider”. I don’t generally get scared of small spiders, but this one was just a bit too much for me. I would be scared of it too! I am sorry I don’t know what it is, but hopefully it is gone by now. I am sure you will look at your unwanted visitor with different eyes! Haha, yes Mami, it was a frying pan!! And you were scared of it and I had to kill it. Now I would also be terrified … I didn’t know how dangerous they were when I beat that sucker with the frying pan. Shame man!! Those are scary and hairy! Yup, it is a Rain Spider sometimes mistakenly called a baboon spider (which have shorter legs). Tough one that – you’re going to have to get help getting him out! But don’t worry, they are more affraid of us! I think it is a man-eating spider. He is a scary fellow. Good to find out he is non poisonous. I always transport them back outside, but the get a big kitchen towel wrap first. Hi Donna – I’m also relieved he’s not poisonous, but I’m still too scared to go to the bedroom before “help” arrives! Unfortunately he is up on the ceiling and I can’t get to it … so no self-catching going to happen here! Even if I could reach, I’m too scared it will fall on my head. Rain spiders. We South Africans call them that, because they come in out of the rain. Not poisonous but can bite. When my Ungardener is not around, I have to use the spider catcher. I reckon it is better to know the spider is back in the garden, than to keep looking over my shoulder. Not web spinners, so they wait for Lunch, then charge. Better in the garden, thank you. Thank you Diana!! I agree, they belong in the garden. I anxiously await my daughter and her man to come and help me “move” him outside. I just hope the spider stays where I can see him until they arrive. They are on their way home from a weekend in Calitzdorp.